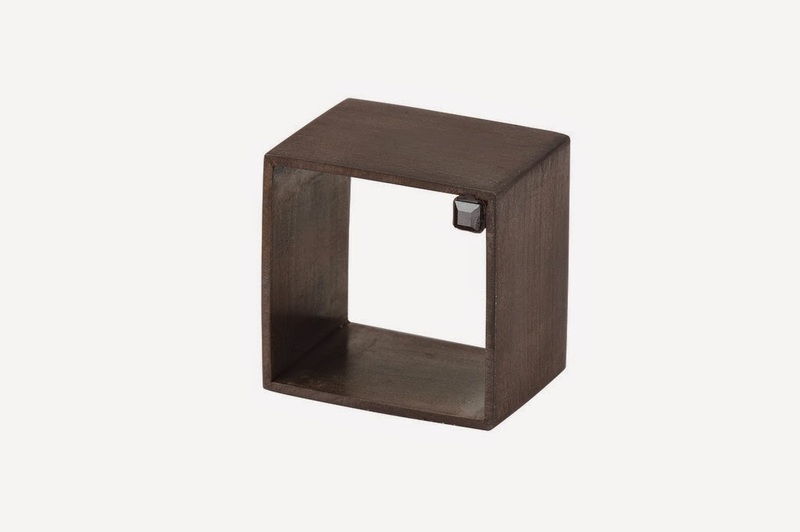 Described as "Scandinavian with an English viewpoint", this geometric black square ring from The Conduct of the Understanding collection is modern simplicity at its finest, however the concept and symbolism is absorbingly fascinating, delving into the complexity of the human psyche and its role in conformist society. The ring symbolises an individual whose own opinionated thought process and original ideas is a preventative from fitting into any niche groups or a role in mass society. This intriguing concept is simplified by using linear and geometric shapes such as squares and circles, two shapes that will never fit together, or belong. Maybe this is an indicative expression of anti-mass produced and monetised commercial jewellery brands, or maybe it's telling me I am one of those individuals that doesn't fit into any niche groups in society, all because my focused interest lies in independent jewellery designs instead of something that can be easily spotted in the high street? If that's the case then I am a square ring. Labels: Charlotte Valkeniers, conceptual jewelry, Contemporary jewellery, Geometric, Geometry, Minimalist Jewelry, Ring, Rock it!